What Is Walker’s New Agenda? Economy, environment, health care, central city problems and UW system all need serious attention. Let’s take Gov. Walker at his word that he is not going to be lured away from finishing out the remaining three years of his second term. He is right on that there is “plenty of work to do” in Wisconsin. Not many people in Wisconsin would have put civil service reform at the top of the state’s agenda, so it was another of the governor’s surprises when he decided to take that on as his first item of business after dropping out of the presidential derby. Walker’s game plan for reform has always contained a heavy element of politics, and civil servant changes reflect that once again. They will further diminish the role of the public unions, his sworn political enemies. The state’s new right-to-work law, passed before he hit the presidential campaign trail, also undercut unions. Remember that job creation was at the heart of the 2014 gubernatorial contest, so that imperative presumably should be high up in his three-year agenda. The Wisconsin economy, like the national economy, has much improved, as evidenced by its low 4.5% jobless rate in August. Nonetheless, wages have lagged here — in the bottom third of states — which means that we have a job quality issue. Further, the state badly needs more high-pay jobs to reduce its debilitating annual brain drain of some 14,000 college graduates. As big corporations continue to downsize, the state’s leaders, including Gov. Walker, will have to turn to entrepreneurs to create the high-end jobs that are often technology based. It has to be more than a token priority to accelerate the excellent progress the state has made in the last 15 years toward a robust start-up economy. All our great employers started here, and it will be ever thus. Another high priority for the governor and his tight band of advisors has to be health care costs. He cost-shifted to public employees in his first term, but that does noting to reform the underlying cost structure. Four out of every five private companies with more than 200 employees are now self-insured, which means they underwrite their own health care risks. That means they have had to learn to manage that risk. In doing so, they have crafted the blueprint for Gov. 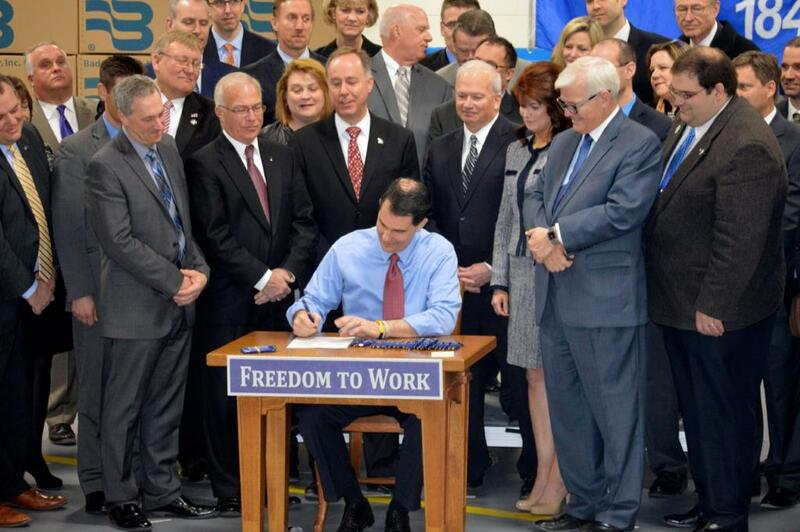 Walker to follow with public employees and eventually Medicaid. If he doesn’t get those bloated costs under control, there will be no state money for other state priorities. An adjacent agenda item is reform of the medical costs under the workers’ compensation program. Providers charge two to three times normal rates for medical procedures in that poorly managed program. The state would be more competitive if several hundred million in excess charges were subtracted from that billion-dollar yearly bill. It will take the governor to crack through on that piece of policy, because it is stalemated in the legislature. As Gov. Walkers sets his agenda, he can’t continue to duck environmental issues like the dead zone in Green Bay, the invasive species in Lake Michigan, the threat of Asian Carp and the severe drop in water tables in central Wisconsin. Sadly, his recent record on conservation issues doesn’t suggest he’ll take up an environmental agenda. But we can always hope that he will see the world through a new lens now that his presidential ambitions are on hold. His anti-conservation posture has contributed to his sharply declining approval ratings. Nor should he be inattentive to the troubles central cities in the state, including Milwaukee and, of late, Madison. Poverty and job start-ups are at the heart of what’s not right there, so job creation incentives need to be tilted in that direction. The high birth rage to single mothers in the central cities has to be tackled, as do scary crime rates. Right up there with these other pressing issues is the need to restore the trustful and supportive relationship between GOP leaders and the leaders of the University of Wisconsin. A nasty mix of political bad blood and financial stress has demoralized the university as it strives to work in a collaborative way to increase state prosperity. The current standoff is unproductive for the citizens of Wisconsin. Gov. Walker needs to mobilize the state’s best and brightest to reset university strategy to support prosperity efforts in our eight regions. Reorganization — the last was 41 years ago — is in order. It can’t be and shouldn’t be done by the governor’s cloistered staff, as has been the pattern on major issues in recent years. In some ways, the brevity of Gov. Walker’s shot at a presidential nomination is a blessing. There really is a lot of work to do at home. Walker will not change his stripes. Nor will his deep-pocketed funders change the agenda they pay him big bucks to execute. That leaves only his ever-decreasing poll numbers to possibly get him to adjust his policies that are drastically hurting the economy, education and the state’s future prospects. My bet is that any policies that would actually help the state would be too hard for Walker to stomach. Instead, he’ll take a cushy job as a DC lobbyist. Since he said he will stay out his term, as Bruce M. has chronicled that means he will absolutely do the opposite. He’ll likely hot-foot it just after the 2016 election once the lay of the land is clear. John, great article, but the leaders here look fro trolleys, Bucks arena to solve problems. No one want to touch these areas, not Barrett, Abele etc, that’s for sure. Only Tommy wanted to take on MPS education to help these kids. Lobbying is not in Walker future, certainly not in DC. heading up a foundation yes.